Police typist Liz Weaver and the murder of Elsie Frost. The people of Wakefield in West Yorkshire were stunned and horrified when fourteen year old Elsie Frost was brutally murdered on the outskirts of the city. This terrible event took place on Saturday October 9th, 1965. The murderer was never found. Fifty years later her sister Anne and brother Colin discovered that the police files about Elsie’s death were sealed. Their parents had gone to their graves not knowing what exactly had happened to their daughter – or why – or who her murderer had been. But now, in the age of the internet and instant communication, Anne and Colin wanted to know more. When they discovered that the files were sealed, they came to a dead end so decided to contact the BBC to see if they could help. (Scroll down to find links to previous articles). In June 2015, just few months before the anniversary of Elsie’s murder, a BBC reporter travelled to Wakefield to talk to Liz Weaver who had been a police typist at the time of the investigation. Liz remembered it well. 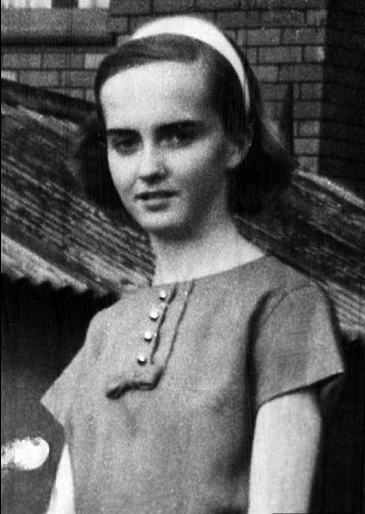 Liz was only twenty one at the time and one of only two typists then employed by the local police. This means that much of the evidence in the files that are now sealed away from public view was typed by her. She explained the system. The typists were not present when witnesses and others were interviewed – it was the police officers who took notes. These were then passed to Liz and her colleague who would type them up. She recalled that the investigation (and the number of statements taken) was immense. She and her fellow-typist had to work during weekends in addition to their normal working hours in order to keep up. She remembered Elsie’s distraught and bewildered parents coming to the police station. It’s likely that Liz was fully aware of the contents of the statements and the police reports. Normally, she explained, the only violence reports she had to type were domestic altercations. Maybe at times the translation between eyes to brain to typing fingers was an automatic thing with little of the information being retained. I doubt this was the case with the horrific Elsie Frost murder that shook the community. It also terrified the community – here was murderer who was targeting young teenage girls and therefore possibly young women such as Liz herself. In the 2015 interview Liz agreed that she was aware of the contents of the details she typed. She said that she didn’t believe that the files should be available to Anne and Colin,Elsie’s sister and brother. Hear the interview in full below. You can read previous articles about the Elsie Frost murder here and here.